It is our goal to support all workshop conveners in designing, planning, and executing workshops that follow best-practices. To that end, this page provides information about those best practices and the Serckit tools that can be used before, during, and after your workshop. If you have any questions about how to implement these features, contact your web team support person. Download the leader webinar slides (Acrobat (PDF) 580kB Feb19 19). Planning an effective workshop is much like planning an effective learning experience for students in the classroom and lab. What goals do you have for the participants? How will the workshop effectively engage participants and ensure that the goals for participants are met? How will you assess whether participants have benefited from the workshop? Here are some of SERC's best practices that have been gleaned over more than a decade of running workshops in On the Cutting Edge and InTeGrate. Active engagement of participants during the workshop: Nothing is deadlier or less effective than a workshop where participants do not participate. Give people an opportunity to participate actively in every session using a variety of techniques: small group discussion, large group discussion, short problem-solving tasks, etc. Model effective pedagogy: The most successful workshop sessions are those taught with good active pedagogy in mind and the least successful sessions are those where a presenter simply stands up and talks. Give participants time to interact and share experience/knowledge: Participants bring valuable experience and ideas to workshops. Structured mechanisms for sharing experiences and expertise must be an integral part of every workshop program. Emphasize practical applications: An emphasis on practical applications and strategies is an important aspect of effecting change in teaching practice. Give participants time to make progress on a specific task that connects the workshop topic to their teaching: Time to work individually during the workshop allows participants to reflect and to make progress on adapting workshop content to their own needs. This can be effectively supported during the workshop by providing opportunities for participants to work one-on-one or in small groups with workshop leaders. Make sure that participants leave the workshop with specific plans for future action: Workshops can produce a wide variety of results ranging from changes in teaching practice and development of new learning resources to department-level planning and community-wide action. In all cases, workshop time devoted to planning next steps and feedback from peers is critical. Provide materials and examples: Examples of how the workshop topics can be applied in the classroom and field are particularly valuable resources for participants. Require some preparation in advance of the workshop: Coming prepared is as important for a workshop as it is for a class. A variety of approaches can be used to prepare participants for the workshop including reflection on their goals for the workshop, development of project ideas for completion at the workshop, assembling materials for sharing, pre-workshop discussion, and participating in surveys of participant needs. Make use of the workshop website: Use the program page to organize documents that you would like the participants to access either prior to or during the workshop. Additional pages of resources can be added to your website if you wish. Each workshop also comes with a private workspace for use by the workshop participants (more information below). The website will be a resource that your participants can return to when they want to make use of what they learned. 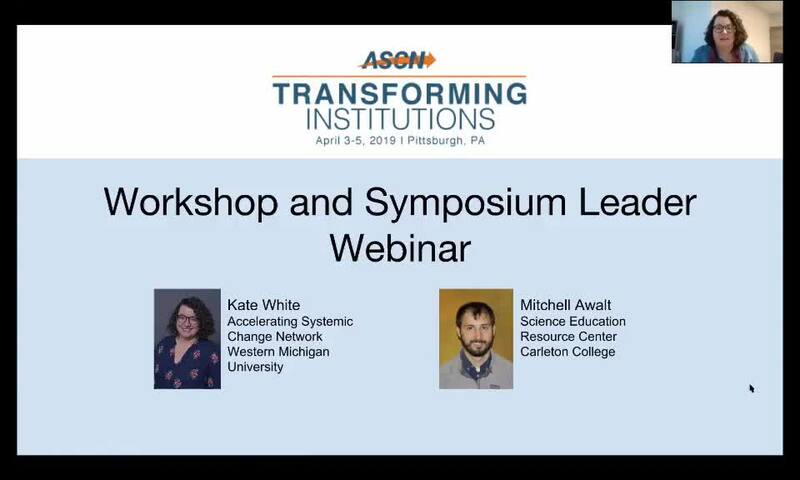 Through Serckit (formerly SERC CMS), you have access to a variety of tools to facilitate the run up to, execution of, and follow-up to your symposium at the Transforming Institutions Conference. If you wish, you can have participants complete and upload an Action Plan for what they will do with what they learned in your workshop. We have a generic Action Plan Template (Microsoft Word 26kB Jun15 15) that you can use directly or customize for your workshop. If you want to make use of the Action Plan in your workshop, let your web team support person know before March 15, 2019 so they can build the necessary upload form in your workshop site. Each workshop has a page available for drafting and publishing a program for your workshop. This will help workshop participants come prepared and knowing what to expect. You must publish a clear workshop program online by March 1, 2019. Symposia leaders may request a private workspace for use by the symposia participants. Participants can easily record discussion notes, synthesize community consensus, draft teaching or outreach materials, develop action plans and many other activities. You can see examples of how Workspaces can be used in the context of a workshop in this Example Workspace from On the Cutting Edge. Your web team support person can help you configure the workspace to support the kind of interaction that you want to facilitate so please have a conversation with them far enough in advance to set things up. Attendance is required in order to take advantage of Workspaces (see below). Since the Transforming Institutions Conference participants don't have to register for the thematic symposia ahead of time, we need to have a way of knowing who is participating in order to provide access to the private workspaces. Symposia leaders will need to direct attendees to a webpage to complete this as they come in so that they can gain access to the workspace. Your web team support person has to set this up specifically for your symposium, so please have a conversation with them far enough in advance to set things up. All workshops are required to have an End of Workshop Evaluation and you will be provided with a form to use. Your web team support person will build a form in your workshop site with standard questions. If you would like to add specific questions to the Evaluation, contact your web team support person before March 15, 2019. Each workshop room has wi-fi access and a projector. Please plan on bringing your own laptop to use for presentations (including an projector adapter if you're using a Mac). Also, plan to bring any supplies you might need (e.g., a clicker). March 15, 2019: Tell SERC support person what features you want. Sooner is better - this is the absolute last date.